I was in Woods Hole Massachusetts last weekend and logged a few tidal bench marks. One (LW1577 "844 7930 TIDAL 7") was dated 1913 and it's the earliest USC&GS disk I have found (although I've found an earlier USC&GS "marking bolt"). It's remarkably similar to later disks. It looks like the standard tidal b.m. disk minus the circle around the center bench line. And interestingly, although it's the oldest of the surviving marks at the site, it was number 7! I wonder what happened to the original 1 - 6? Probably some of those were chiseled squares, crosses, bolts, etc. Anyone know when the USC&GS started using these disks? What's the ealiest USC&GS disk anyone here has found? 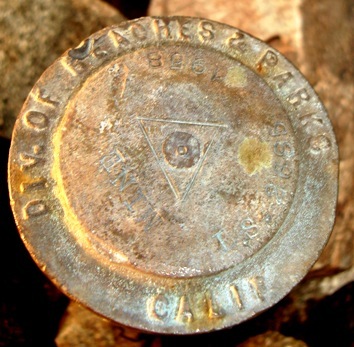 I know the USGS used disks very similar to today's by 1900 (I logged one last month in Maine which was discussed in another thread). Buckbrook: is this a new type for your list, or have you got one like this before? Found it on top of a mountain peak in the middle of the Borrego Desert! KE0381 - Monumented by "RBNF" [Researched But Not Found]. I assume it was the CB&Q Railroad or the State Hwy Dept. Both would be interested in the clearance between the rail and the overpass. AD9796 - Missouri Dept of Natural Resources. Not really a disk, but a 8-sided piece of metal (copper?). Here is an earlier pipe cap. I think the oldest USC&GS that I have found. Ok, it's been a while since the last update. There will be another update shortly, with half a dozen from this discussion, plus a few more from other topics, some from Waymarking and whatever else I can find. ARSINC (NY) American Rock Salt, Inc.
ROSINC (NC) The Rose Group, Inc.
PU1560 (US) Bureau of Land Management - "Not a Survey Corner"
One I can't read. Anyone? Heres a disk I bet you dont have. Looks like a food can got caught in some cement. That’s what I thought, but they logged it as a find. CAN I log it too? I think some of the rest of the 'marker' is in the GPSr's shadow. 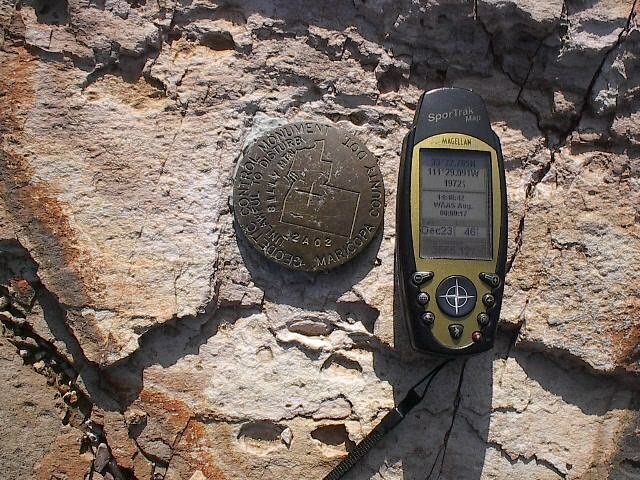 ZZ0000.and adjusted by the National Geodetic Survey in December 1993. ZZ0000.The Laplace correction was computed from DEFLEC99 derived deflections. ZZ0000.The geoid height was determined by GEOID99. ZZ0000; North East Units Scale Converg. ZZ0000.Superseded values are not recommended for survey control. ZZ0000.NGS no longer adjusts projects to the NAD 27 or NGVD 29 datums. ZZ0000.See file dsdata.txt to determine how the superseded data were derived. ZZ0000''LANES, IN THE SOUTHWEST QUADRANT OF THE INTERSECTION. 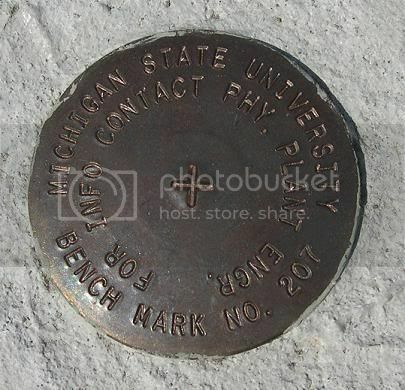 Here's one monumented by Michigan State University that I didn't see in the list yet. There's no date stamped on it, but it appears to have been monumented this past summer during some roadwork on campus. In fact, a wooden stake next to the disk had "proposted monument" written on it. I have a USAF marker here somewhere. As soon as I can find the pic, I'll post it. City of Bellevue should be listed as WA not OR. Very infrormative thread and I love your site BuckBrooke. I was recently hinking and benchmarking on and near the NH/Qebec border as well as the Maine/Quebec border. I recoverd an IBC station (QH0523) which was marked by an IBC disk I had not seen before. It was a standard sized disk (unlike the small 2 inch triangulations stations and bench mark disks I am used to seeing up there). 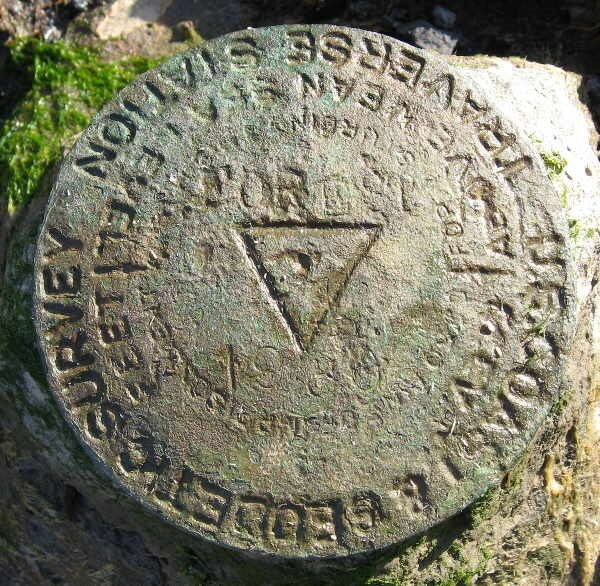 It is mounted on the top of a cut off cast iron boundary monument. It looks like they kept repairing the thing and finally gave up, cut it off and mounted this tablet on the top of the stump. 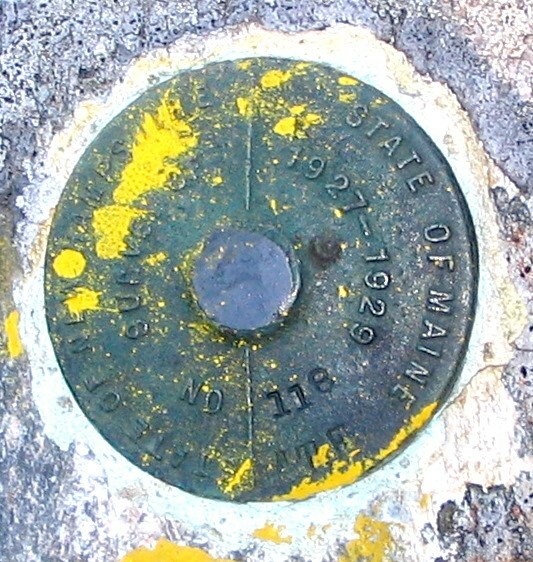 Only the disk is visible (with an outline of the old cast iron post). Since it was right by some one's lawn, I didnt want to do any unneccessary digging to see the stump or original base. It's also a bit warped, but otherwise in good condition. As a request, please look through agencies that I have listed, but that don't have photoes. If any are near you, would you mind going over to find them, and snap a photo? Many are found, many are not found. So, where's the official list to search for nearby ones to find for you? Harry Dolphin; Scroll down the page at BuckBrooke's Master Agency List and you will find a section for discs that are recorded as found/recovered without photos and another section for discs that have not been found or recovered but indicate a unique disc somewhere in the discription. 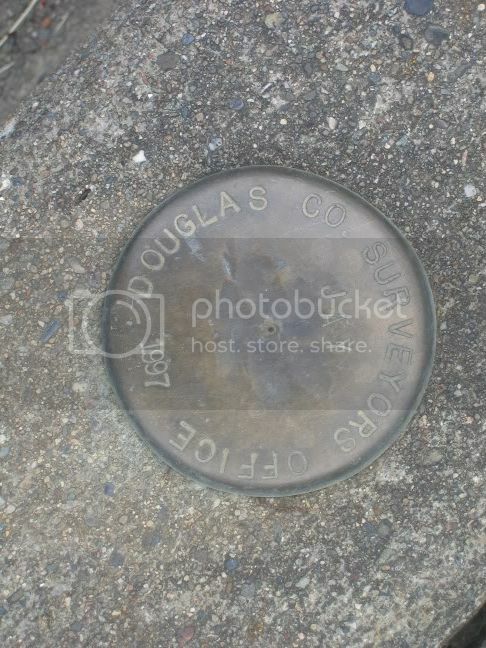 BuckBrooke; I checked on the submissions update and the Lane County Surveyors disc (OR) carries the same designation as the Lane County Public Works disc right above it. It links to the correct photo though. Thanks for the list and for your work in updating it. Ok, the list is up to date with changes. CWENCO (OR) Century West Engineering Corp.
SHHICO (OR) Shevlin Hixson Co. Sorry the Weymouth one's so blurry - didn't look like it on the camera preview pane. I just looked at your master list, and was impressed to see that you already had a disk that I logged on 9/18/06. 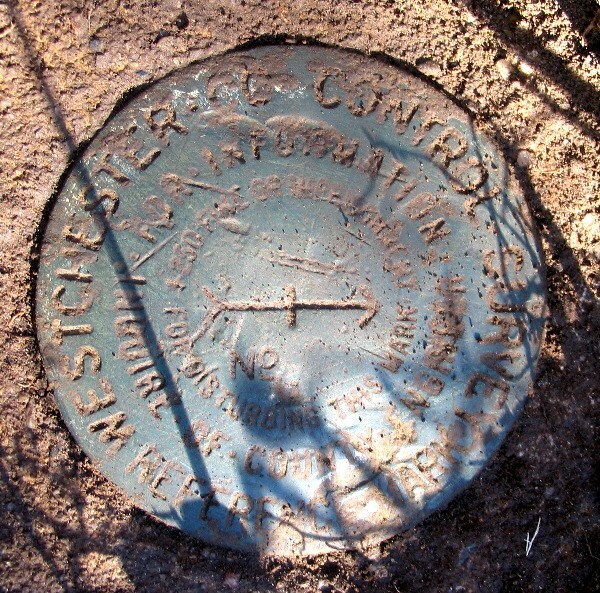 (AE6516) Although it is a cadastral disk, marking a corner of the Appalachian National Scenic Trail Exterior Corridor Boundary, it was subsequently used by the VT Agency of Transportation for control on a bridge project just down the road. That's how it got into the NSRS (National Spatial Reference System). 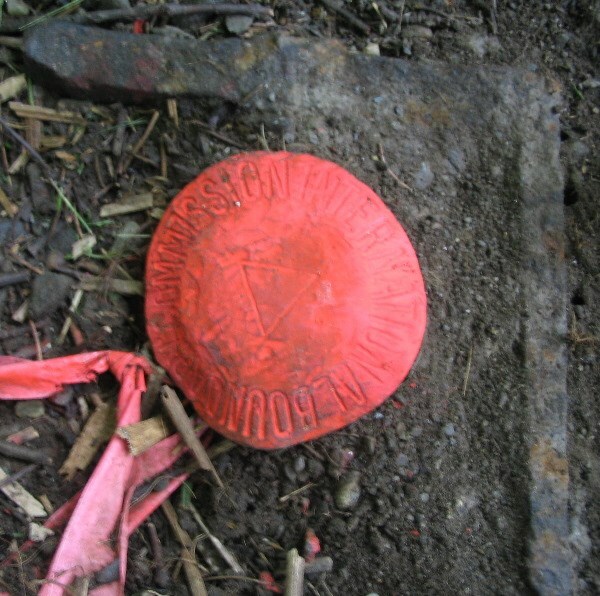 There are literally thousands of these disks along the 2100+ mile length of the AT. I am personally responsible for the placing of several hundred of them here in Vermont. I would be interested to know if any others have found their way into the NSRS. For further database info, the government agency that contracted these surveys is the US Department of the Interior, National Park Service. I'm reasonably involved with the AT disks on the corridors. I'm working with Sally Naser to make a useful online database; we started discussions just as my old dissertation topic fell through this spring; I've settled personal matters, and will be getting going on it soon. Send me an email. My impression is that only a handful of the AT disks are in the NGS database; text searching through the appropriate state PID text files found 2 or 3, as I recall when I was going through the databases this spring. 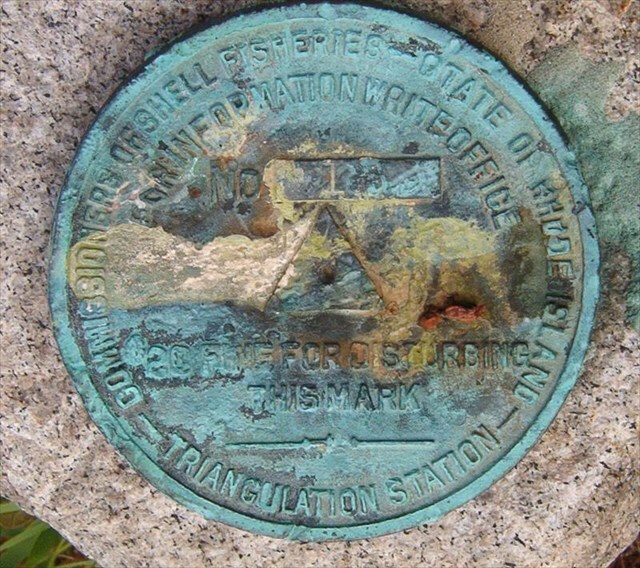 I recovered a couple of state boundary line monuments over Columbus weekend. Vermont-New Hampshire Reference Monument No. 84, This is non-NGS, but I put up the photo with QH0734 "BOUNDARY REF MON 86" which is just down the road. No. 84 is in better shape so the picture is a better one to use. 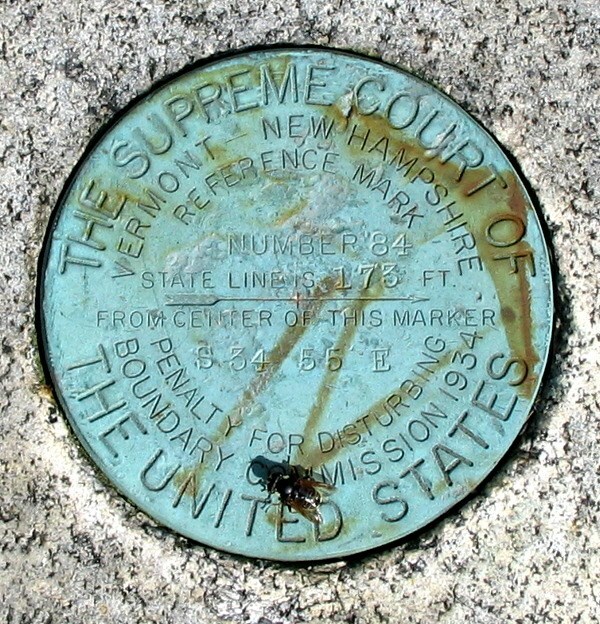 Maine-New Hampshire Boundary Monumewnt No. 118. This is also non-NGS but I put the photo with a nearby station (which I didn't find) QH0543 "RUMP IBC". 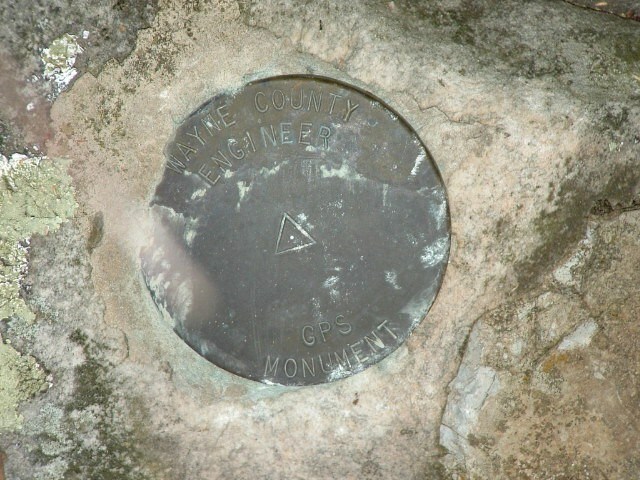 The boundary monument was on the west slope of Rump Mountain (on the summit of which the IBC station was supposed to be). I believe there are some ME-NH monuments in the NGS database, further south. The initials "ATF" appear at the bottom right - anyone know what they might stand for? I've made these changes. Here are a few more from the gallery, Waymarking, Flickr and email submissions. Being the one who took the photo, I have no idea what the marker is for. 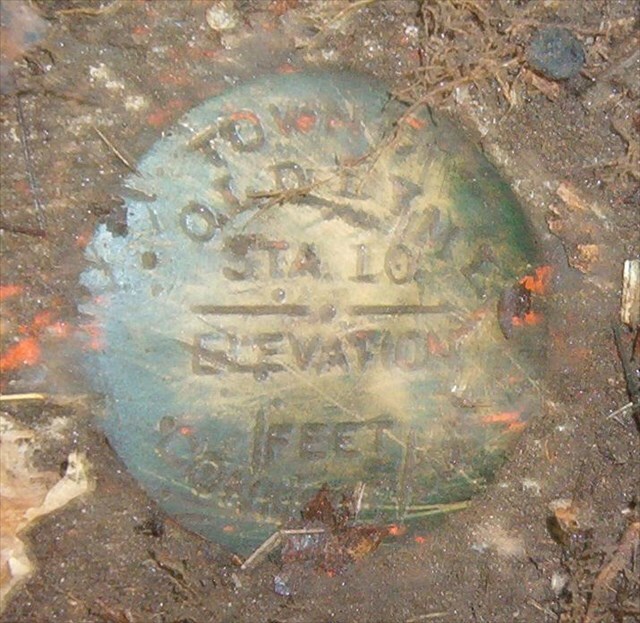 It may not even be a survey marker. I'm still trying to research it. I haven't had time to contact the company (WTU). The location is San Angelo, TX and WTU is West Texas Utilities Company. 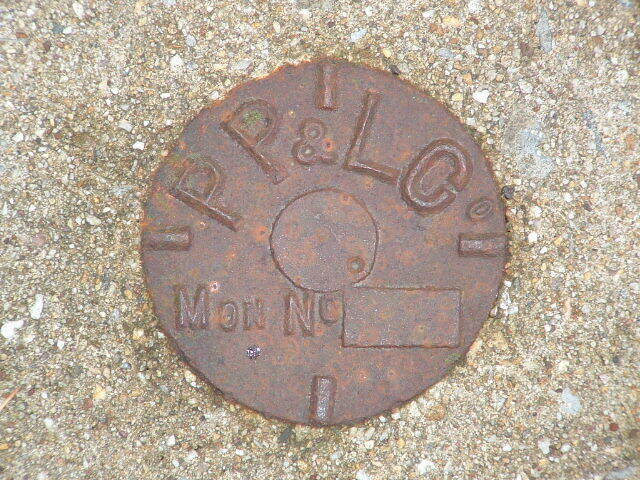 Definitely not NGS, and it looks more like a washer held in place by a rivet, but we saw it on the sidewalk, so we took the picture. About 34th Street and Third Avenue, NYC. 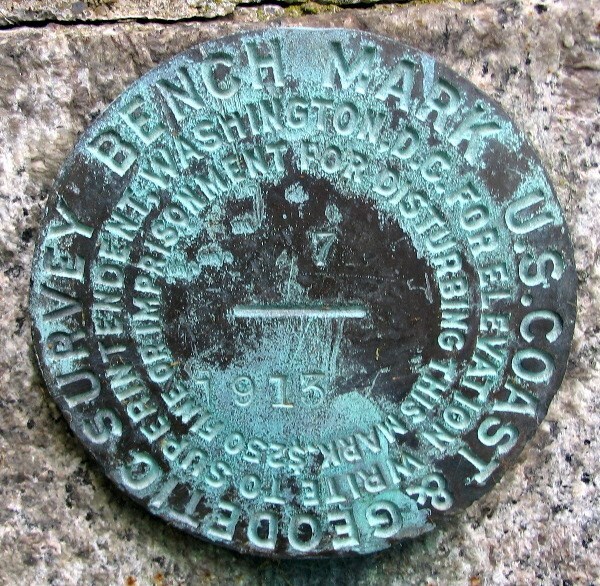 Triborough Bridge and Tunnel Authority benchmark. Here is one we found while visiting Walnut Canyon Nat'l Monument. It is Not in the NGS database. 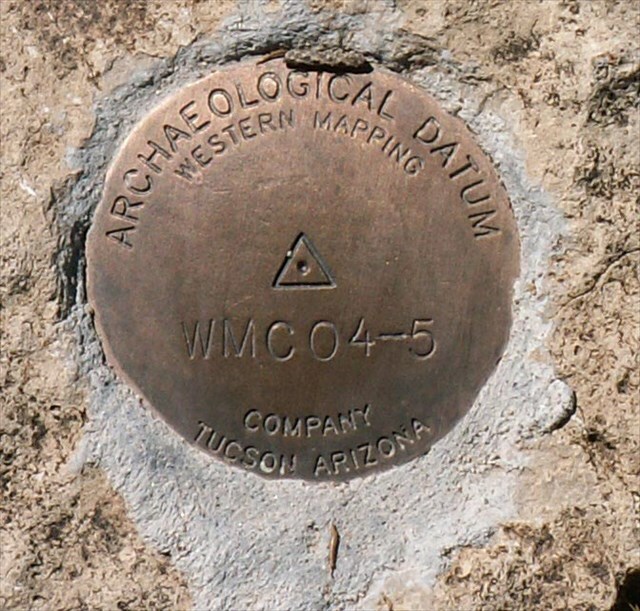 Don't have a clue what an ARCHAEOLOGICAL DATUM is! It's probably something like WGS 1984 BC. Can't say, we're not THAT old! Ok, I've updated the above submissions. Here are a few more, gleaned from the usual sources. Also, a dozen corrections/improved photos/rearrangements to the list. As usual, the largest number found are in California. Are there more people getting out and hiking there? Anyways, I've noticed that a fair number of the MN counties seem to have their own disks. Anybody from MN, could you verify this, and maybe supply a few more photos? Here's one I found yesterday I haven't seen before. 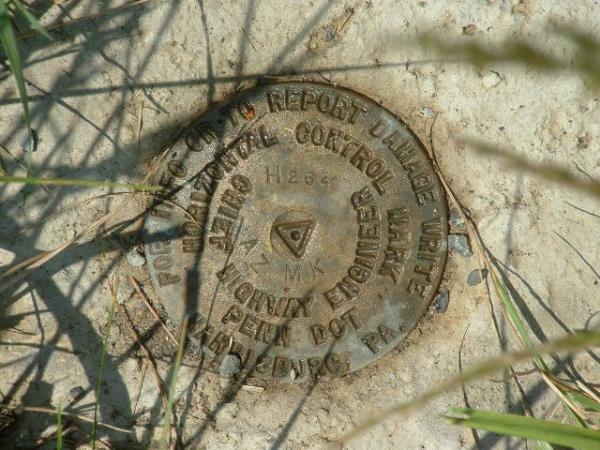 It's a reference mark set by Westerchester Co. Control Survey, and arm of Westchester County NY. It was set in the 1930s on the Palisades for station KU4051. It's unstamped. Here's one aI had not seen before. 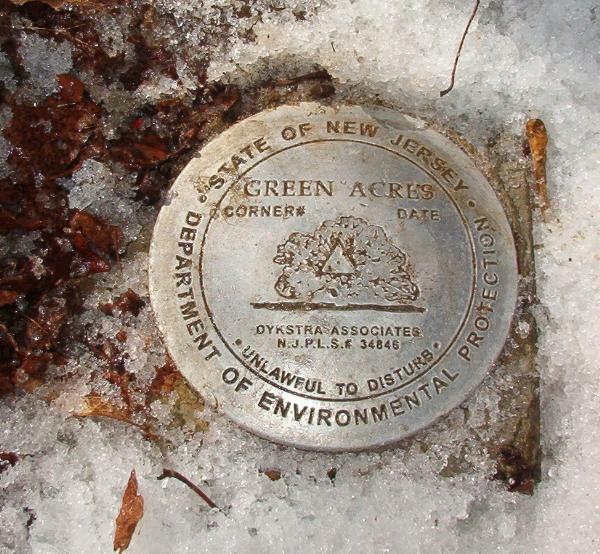 A CGS "Traverse Station" disk from 1930. A disk from Maricopa County, AZ. My sons and I started geocaching only a few weeks ago. However, while reviewing video / pictures from one of our camping / ghosttown trips this last summer, we found the attached picture. I assume it is a benchmark of some kind. 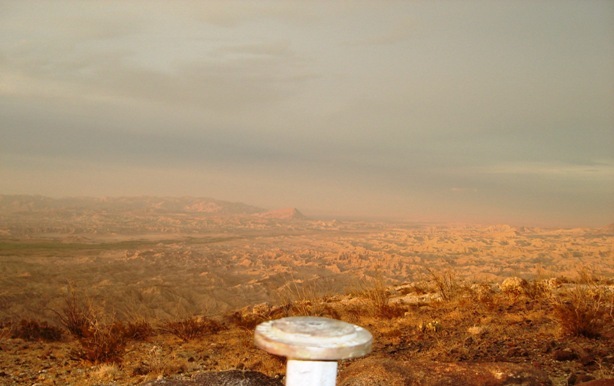 We took this picture at the top of the Happy Jack Chalk Mine near Scotia NE. I thought you might find it interesting. If you know any more about this particular item, we would be interested to learn. I have also included a picture of the view from the peak (2000 feet is high for Nebraska), above the chalk mine (north loup river). they are in the happyjack album. 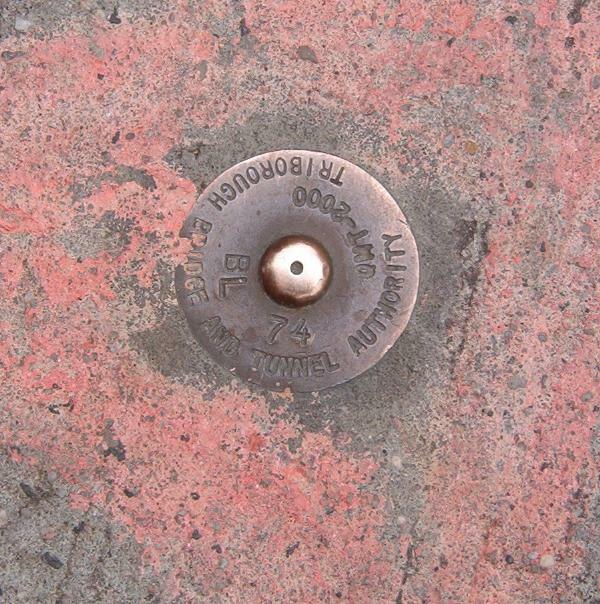 Actually I was looking for LY0802, and I saw a post with tape labeled Monument #1, and dug in the snow. I haven't been able to find a PID or waymark for it, but I found a really interesting Smitsonian Institution benchmark disk w/o a GPSr on the Mall in DC. City Of Kent(OH) has a series of these which includes 42 disks. The FR and BR prefixes stand for the original townships, Franklin and Brimfield, parts of which have been incorporated into Kent. Kent is in Portage County about 10 miles east of Akron. Thanks, everybody; I'll try to put them in this weekend. I'm not spending as much time on benchmarking as I used to, as I got a fellowship to finish my dissertation and am commuting 160 miles/day (80 each way). Kind of takes the fun out of driving on the weekends. Also, my days are longer. As a fun note, I'm making images of bipolar jet flows coming out of evolved stars. Tip to tip on the lobes of the stars is 350 milli-arcseconds with pixel size of at worst 100 micro-arcseconds. I should be able to measure parallaxes in the next year of 50 uas with 5 sigma accuracay (all the way across the galaxy).